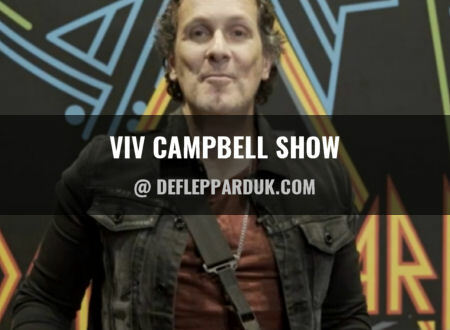 Def Leppard guitarist Vivian Campbell hosted the fifth edition of his new rock show last night on Radio Ulster. Vivian's fifth show featured 11 songs. "Black Crowes and Hard To Handle. And sure why not?. Great band, great album and then they go and split up. What is wrong with these bands they can't keep it together for more than a record or two?. And it is tough being in bands. And trust me I think I probably know that just about more than anyone I've been in so many. But at the same time when you find great chemistry with other musicians it really is a magical and unique thing. And I do believe that Black Crowes had that in abundance. They had some really proper rock and roll swagger to them. So it's just a great pity they couldn't keep it together any longer." "I'm Viv Campbell and welcome to show number five in this series of ill advised shows. I just landed in Hawaii where I'm recording this show from actually. So Aloha! as the locals say here. It's a long long long way from Norn Iron. About as different as you can imagine. I haven't seen too many pineapple's growing on the hedgerows of Ulster if you know what I mean." 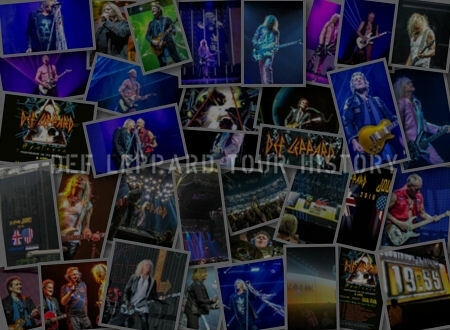 "Anyway I'm here to rehearse a few days with Def Leppard before we start what will be phase two of our world tour. We're gonna be changing up the show. Hence the rehearsals and for the rest of this year we'll perform the Hysteria album in sequence. And so we're gonna be building our production around that. And we take it from Hawaii on to Japan and Australia and New Zealand. And after that I think they give us about 20 minutes or so to recuperate before we take it to Dublin in early December and Belfast. Yes Belfast on December 2nd so I'm very excited to be playing in my home town again." "I can't think of any Hawaiian acts to play. And besides in Hawaii people just lay on the beach and drink fruity drinks most of the time. All in all it's not terribly rock and roll, this is however." "That was the mighty Motorhead with Bomber. Not really a song you'd listen to on a Hawaiian beach. Having said that I may be in Hawaii but I'm certainly not on the beach. And you know if I was I'd probably still be listening to rock but maybe something just a little bit more laid back and in the grooves. Something like this"
"Cheap Sunglasses, you need those in Hawaii. That was ZZ Top or is it Zed Zed Top?. Depends who you ask I guess but I occasionally play that song in a local Los Angeles club with some very talented friends of mine. And I suppose that aside from maybe the weather that's one big advantage of being in Los Angeles. There's just so many great wonderful, talented musicians. And for the most part many of them love to just get out play as indeed I do." "And when we're jamming in these LA clubs it's always cover songs that you play. You never play your own music. It's just great craic to play other people's music for a change. And I've even tried my hand at this one a few times." "Oh Well by the original Fleetwood Mac with the great great Peter Green on guitar. Such and sweet and toneful guitar player Peter Green is. And indeed as Gary Moore was the great great influence to me Peter Green was a great influence to Gary. And the 1959 Gibson Les Paul guitar that Gary played famously throughout most of his career. That was actually Peter Green's guitar. His original guitar. And Peter sold it to Gary for the nominal fee of 300 dollars apparently. Gary eventually sold it to a collector just a few years before his death. Allegedly for over a million dollars if you can believe that. And then a year or two later it was eventually sold on to Kirk Hammett of Metallica apparently for a figure closer to two million dollars. So that is quite a return on an investment. So not only was Gary Moore my greatest ever guitar hero back then but he probably should have been my business manager too. You now what I mean. I've met James and Lars from Metallica a few times but I've never met Kirk. If and when I ever do meet him though I know exactly what we're gonna be talking about. "That was the Jeff Beck Group featuring Rod Stewart and a version of the blues classic I Ain't Superstitious. That was a bit good wasn't it?. That song was written by Willie Dixon. A man who wrote many, in fact a great many of the blues classics. It was made popular by Howlin' Wolf in 1961 and do yourself a favour and check out the Howlin' Wolf version it really is mighty. You might however want to avoid the version that I recorded on a blues album I did in 2005. In my defence however I did record the album absolutely live in the studio as I was trying to get an authentic feel to it. So as such the vocal's a bit ropey. A bit dodgy if you know what I mean. In any event you'll be really pleased to hear I'm not gonna subject you to that tonight. So you can breathe a collective sigh of relief there." "As I mentioned what we just heard Ain't Superstitious was from a 1968 album called Truth. And speaking or truth." "That was Ian Hunter from his first ever solo effort 1975. That was Truth, The Whole Truth, Nuthin' But The Truth featuring one of rocks' greatest ever guitar solos. From one of rock's greatest ever guitarists Mick Ronson. Mick is a player who is all all too often overlooked and he was one of the true true greats and a lovely lovely gentleman to boot." "The Who Love, Reign o'er Me. 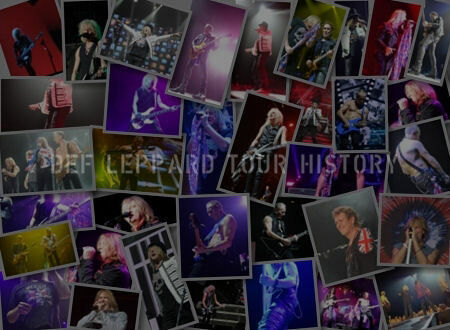 You know pretty much exactly a year ago we, the Def Leppard we, played a couple of shows in South America with The Who. 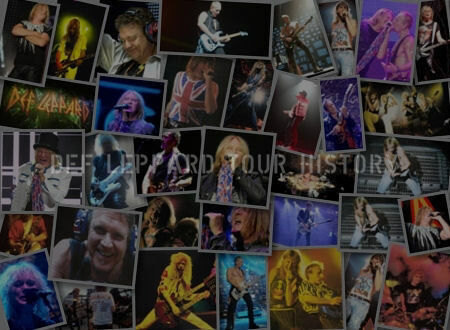 And I can tell you that never before have I ever witnessed all five of us, Def Leppard, standing side stage and watching an entire performance of any other band we've ever shared the bill with. We were just like giddy schoolboys and it was epic stuff. Pete Townshend was lovely. He actually came back and said hello to us all before our show. We were opening the evening of course and after we had performed I came offstage. I took one of my more favourite guitars. It's a '56 Les Paul Gold Top reissue. Which incidentally I've named after my lovely wife Cait. Anyway I took the guitar to Pete's dressing room and I very sheepishly knocked on the door. Like excuse me Pete. I said do you think there's any way you could sign my for me. And he was most gracious. He produced a black sharpie pen to do the job. But I had a different idea so I pulled out a small screwdriver from my back pocket. So he looks at me and he says: 'Are you sure you want me to do that to nice guitar?'. And I'm thinking this guy is Pete Townshend he used to smash guitars every night as part of the show back in the sixties. Bottom line Pete carved his name into Cait for me. It's not very easy to see but it is there. So like Pete's songs it's indelible if you like." "I Ain't The One Lynyrd Skynyrd from the album Pronounced 'Lĕh-'nérd 'Skin-'nérd. That came out in 1973 and at Christmas of that year my cousin Richard gave me that album for Christmas. And I literally did not stop playing it until 10am on Boxing Day. I think that was my first ever all nighter that I pulled. And you could do that kind of thing was relative ease when you're eleven. As I was then. I have vivid memories of that Boxing Day being like punch drunk from the lack of sleep mixed with the joy, the elation of discovery. Not only having discovered a great new album but apparently this whole new genre of music. This magical Southern Rock movement thingy. But unfortunately my fascination with Southern Rock very quickly turned, well it turned south. Forgive the pun. As I soon realised that I'd be introduced to its zenith with this album and pretty much the rest of it didn't even come close to fulfilling my young guitar fuelled fantasises. the triple guitar lineup that recorded that album were just very very much in sync with each other. It really is a testament to great musicianship." "As an interesting side note by the way The Who who we previously heard and Lynyrd Skynyrd they both toured in that very same year 1973. But right now I'm going to jump not only out of the 1970s but indeed into the next Millennium. Into an uncertain future that no one knows." "No One Knows Queens of the Stone Age from the album Songs For The Deaf. I have no conection whatsoever to that band but I really really do enjoy what they do. And the drummer on that album was Foo Fighters and Nirvana drummer Dave Grohl. And interestingly he bought the Neve recording console from a famous studio called Sound City Studios when it closed down in 2011 and he had it installed in his home studio. And why do I mention that?. 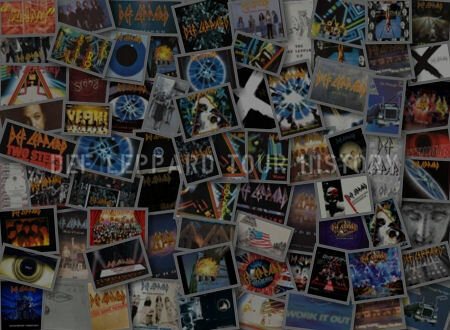 Well as it happens when I first landed in Los Angeles in late 1982 to write and record with the DIO band. The studio we were recording in was this place Sound City. We recorded Holy Diver on that very same Neve console. And I believe thay call this segway." "That was Invisible. DIO from the album Holy Diver recorded at Sound City Studios in Los Angeles at the very end of 1982. And I was a fresh faced 20 year old. I had absolutely no idea that this studio was such a famous facility and so many great records had been recorded there. To be honest I thought it was kinda dingy you know. It seemed like it could do with a lick of paint if you know what I mean. But in between takes when we were working I'd wander the halls of the place and I started to take it in. I started to realise and notice all the Gold albums on the walls. And one of them happened to be this." "That was Refugee. Tom Petty & The Heartbreakers from the 1979 album Damn The Torpedoes. Another landmark record recorded at Sound City Studios before they turned it into a Walmart or whatever it is, whatever it's become now." "I'm gonna have to wrap things up now and get going to rehearsals. Next week will sadly, sadly for me at least, probably a relief to you, will be the final show in this series and I really have thoroughly enjoyed doing this. I must say who knew it could be so much fun. this week's show has featured so many of the guitar greats who inspired me. So let's closed out the show with yet another. I don't think there's any disputing this man's credentials and this song happens to feature my favourite ever ever solo and particular guitar lick that he ever played. Anyway I'll be off in Japan next week. I'll give yous a shout from there. I am Viv Campbell and I'll see ya anon."